The latest release of EasySMF includes a function that many people have been wanting: the ability to load data from the Windows command line. This allows you to create automated scripts to load data into EasySMF. ftpjcl.txt – JCL to transfer data using a z/OS batch job. To find the samples, go to Start -> All Programs -> EasySMF -> Samples. We are currently reviewing the price of EasySMF. Due to the continued weakness of the US Dollar relative to the Australian Dollar (a decline of almost 40% since pricing was announced and 20% since EasySMF first went on sale!) a price rise is unavoidable. To give fair warning, new prices will come into effect from 15th April. Licenses and renewals before that date will be at the current prices. If your license expires soon after 15th April or if you just want to save a few dollars you can renew early to get the current prices. Existing licenses can be extended even if they are not due for renewal. On the EasySMF Purchase page select “Renew License” and enter your current license key. The remaining time on your current license will be added to the new key. This report shows SMS information for newly allocated non-VSAM datasets. Dataset attributes and SMS information are shown. You can filter the list to show datasets created with a particular storage class, data class, management class or storage group. Storage group information isn’t included in the type 14/15 records, so EasySMF uses type 74 subtype 1 records to map volumes to storage groups. This report shows uses several record types to track non-VSAM datasets being created and deleted over time. 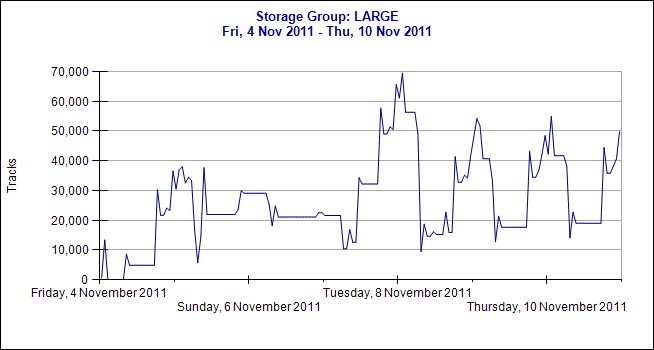 It gives an indication of the peak storage demand in your storage groups, and how much space is used. Not all allocations are included (e.g. VSAM datasets, datasets allocated but never opened and additional extents for existing datasets are not included) and some assumptions need to be made about the time the datasets are created, so it can only provide an indication of the space required. Despite that the information is interesting, and can show patterns in creating and deleting datasets. It could be useful to work out the best time to run utilities to monitor free space. Or it might show storage groups with completely different allocation patterns where the free space could be combined. Click and drag on a chart to zoom in on the peaks. Click on the chart to drill through to the Non-VSAM SMS Information report, which will show the datasets allocated in that storage group during that interval. Then scroll across and click the header for the Tracks column to sort the datasets by size. From that report, click a job name to drill through to the Job Detail report or the dataset name to view the Dataset Activity report. This report lists jobs which suffered B37, D37 and E37 abends, and volume selection failures when allocating a dataset. A high number of these events might indicate insufficient free space in DASD pools. These reports show various statistics from the type 64 records for VSAM and type 14 and 15 records for non-VSAM. Information about the jobs using a dataset, number of EXCPs and number of extents might be interesting.